By: Ruffin Prevost | June 29, 2012 View as "Clean Read"
Update: 5:15 p.m. Friday, June 29: Seven hours after this story was first posted, Yellowstone National Park “formally” released its winter-use plan at 5:01 p.m. Mountain Time. CODY, WYO. — Snowmobiles and snow coaches in Yellowstone National Park will be managed using a “transportation event” concept, Sylvan Pass will remain open and daily noncommercial guides from each gate will be allowed to lead groups using snowmobiles under the preferred alternative outlined in a draft winter use plan posted online today by the National Park Service, but later removed from the Park Service website. Park planners had intended to release the plan today, and had loaded documents onto the Park Service website in anticipation of their release, said Yellowstone spokesman Al Nash. Yellowstone Gate downloaded those planning documents and posted them as part of this report. “But then we had a request from some folks in Washington to answer some questions that are all about process,” Nash said, so the planning documents were pulled down until those questions can be answered. Nash said he expects the plan to be “formally released” sometime next week, but that he does not anticipate any changes to the documents posted with this report today. A transportation event would initially equal one snow coach or one group of about seven snowmobiles, and a total of 110 transportation events would be allowed in the park each day. Operators would decide whether to use their daily allocation of transportation events for snowmobiles or snow coaches, but no more than 50 daily transportation events could come from snowmobiles. Snowmobile groups could have up to 10 sleds in each transportation event, but must average seven sleds per event over the course of the entire season. Four of the 50 daily snowmobile transportation events would be reserved for unpaid guides leading groups of up to five sleds from each of the four gates. Over-snow travel in the park under the preferred alternative would continue to be with guides only. But up to four transportation events per day (one at each winter gate) of up to 5 snowmobiles each would be allocated for non-commercially guided access. Sylvan Pass, between Cody, Wyo. 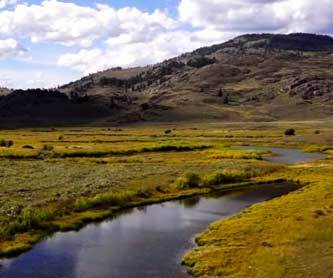 and Yellowstone’s interior, would remain open, and would continue to be managed under guidelines developed by the Sylvan Pass working group. Read more stories about the debate over winter use in Yellowstone Park. Best-available technology requirements for snowmobiles would remain the same as the BAT requirements in the 2011/2012 interim regulation until the 2017/2018 winter season, at which time additional sound and air emission requirements would be implemented. BAT requirements for snow coaches would also be implemented beginning in the 2017/ 2018 season. As technology advances and vehicles become cleaner and quieter, the group size of snowmobiles would be allowed to increase from an average of 7 to an average of 8 per transportation event, and snow coaches would be allowed to increase from one to two snow coaches per transportation event. Efforts to nail down a long-term winter-use plan have been complicated by public debate, including court challenges over issues like snowmobile traffic and avalanche management on Sylvan Pass. 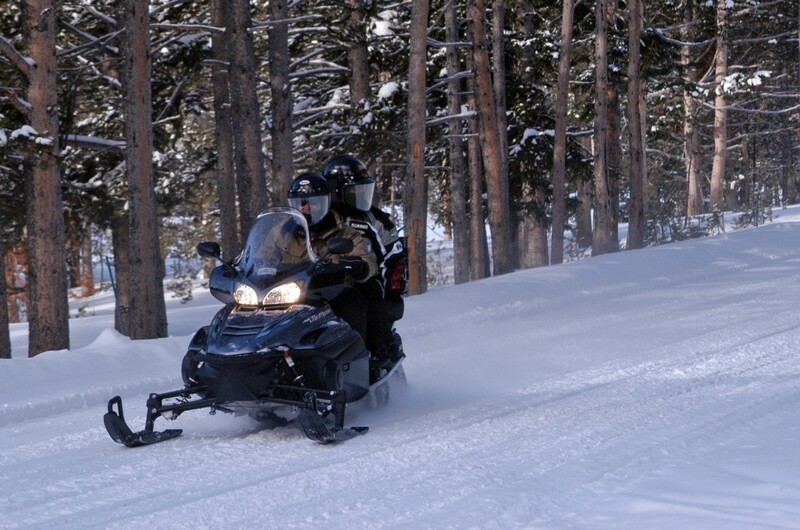 Many individuals and advocacy groups, including the Greater Yellowstone Coalition, are opposed to allowing any snowmobiles in the park, saying the machines are dirty, noisy and a poor match for the tranquil winter atmosphere in Yellowstone. Snowmobile advocates say newer machines are quieter and cleaner, and that they are an appropriate way to tour Yellowstone. Gary Fales, the lone commercial guide bringing snowmobiles through Yellowstone’s East Gate over Sylvan Pass, said Friday morning that he was happy with the draft, and praised Yellowstone Superintendent Dan Wenk as “a real common-sense kind of guy.” He said allowing non-commercial guides would be a good way to help build traffic through Sylvan Pass and justify what he agreed was a steep cost to keep the pass open for what in recent years has been a relatively small group of annual users. Jeff Welsch, spokesman for the Greater Yellowstone Coalition, said in an email Friday morning that the group would spend some time reviewing the draft plan. Additionally, the four entrances would also each be allowed one non-commercially guided snowmobile transportation event daily. Under the preferred alternative, four transportation events each day (one per gate) of up to five snowmobiles each would be reserved for non-commercially guided access. Each unpaid guide would be allowed to lead up to 2 groups per season, and permits for those trips would be allocated via an online lottery system. Closing Sylvan Pass was a potential option outlined in some alternatives that was opposed by many in Cody. The 1.5 mile stretch of road at an elevation of 8,524 feet lies between the East Gate and Fishing Bridge, and is subject to avalanches throughout the winter, as well as spring and summer slides. 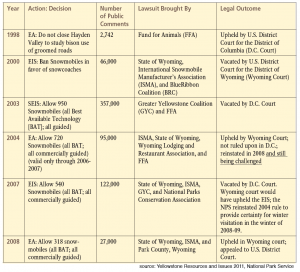 A 2007 draft winter-use plan proposed closing the pass, but public outcry from Cody residents and pressure from Wyoming elected officials brought about a working group and discussions with park officials that later resulted in a reversal of that decision. Various conservation groups have objected to the risk, cost and environmental effects of using a howitzer cannon to mitigate avalanche risks along the pass. 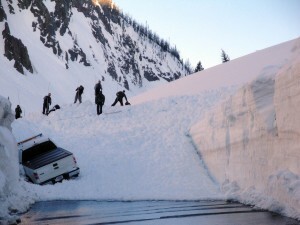 According to planning documents made available Friday, Sylvan Pass would be managed using a combination of avalanche mitigation techniques, “including forecasting and helicopter and howitzer-dispensed explosives.” The Park Service and federal safety regulators would continue to review the process to address worker and visitor safety issues. Sylvan Pass has long been a hot-button issue in Cody, said Scott Balyo, executive director of the Cody Country Chamber of Commerce, who briefly reviewed the draft plan Friday. Park planners and many gateway business owners are hoping that whatever final winter-use plan that results from today’s draft will stand up to anticipated court challenges and allow concessioners some measure of certainty in marketing and operating winter tours into Yellowstone. Conversely, many opposed to snowmobiles in the park had hoped the new plan would call for phasing out the machines in favor of rubber-treaded snow coaches, which allow groups of a dozen people or more to see the park from a heated cabin similar to a shuttle van. The numerous judicial battles over past plans have made it virtually impossible to craft a long-term plan that can survive litigation. New ideas for winter-use management in the last decade have been rare, as opponents have dug in their heels on key issues. During that time, the Park Service has produced numerous new studies, draft plans and technical analyses — often in response to court rulings, including findings from different federal courts that aren’t always in sync with each other. Under what the Park Service has called a “market approach,” operators offering both snow coach and snowmobile tours will ultimately be letting the public decide the mix of vehicles in the park by their purchasing decisions. Transportation event management would reduce overall noise, while also creating practical limits for emissions and stresses on wildlife, Yellowstone management assistant Wade Vagias said in a March interview. It would also give tour operators and visitors more flexibility to choose vehicles and set group sizes and schedules. He said such a management model could result in less noise in the park while potentially allowing more visitors through each day. The market approach is set up to reward innovation and technological improvements, particularly in designing and adopting quieter snowmobiles and snow coaches, Vagias said in March. But it’s also aimed at diffusing the seemingly intractable debate over the specific numbers of snowmobiles and snow coaches to be allowed in the park. At least a half-dozen different sets of winter-use planning documents dating back more than 10 years have all proposed specific fixed daily limits on a combination of vehicles, such as 318 snowmobiles and 78 snow coaches. None has resulted in a lasting management plan, as local governments and interest groups have inevitably sued to block the plans because they allow either too many or too few vehicles in the park. Each successive legal challenge and ruling by the courts — along with existing regulations, scientific findings and visitor expectations — has further limited the options available to planners for creating a workable winter-use plan, especially when any new proposal is almost certain to draw another round of litigation. The Park Service will receive public comments on the draft plan for 45 days, and will release a final plan in September. The Park Service intends to have a final supplemental environmental impact statement, including a Record of Decision and a long-term regulation, in place in time to govern the start of the 2012-2013 winter season. Additional details regarding public meeting locations and times will be posted on the National Park Service website. Contact Ruffin Prevost at 307-213-9818 or [email protected]. Ruffin Prevost is founding editor of Yellowstone Gate, an independent, online news service about Yellowstone and Grand Teton parks and their gateway communities. He lives in Cody, Wyo., where he also works as the Wyoming reporter for Reuters news service. He worked from 2005-10 as the Wyoming reporter for the Billings Gazette and has also been managing editor of WyoFile. A commercial guide leading a group of kayakers in Yellowstone National Park died Wednesday after attempting to rescue a client who capsized in the frigid waters of Yellowstone Lake. Timothy Hayden Ryan Conant, 23, from Salt Lake City, Utah, died after rangers responding to a cal for help found in the water in the West Thumb area of Yellowstone Lake, according to a statement released by the park's public affairs office. CODY, WYO. — Heavy spring snowfall this week caused Yellowstone National Park managers to temporarily close some entrances, and motorists in parts of the park were told snow tires were required for entry. Roads in Yellowstone and Grand Teton national parks will soon close for the season to wheeled vehicles, but there is still time to get out and make up for time lost to the government shutdown. Here are a few insider tips on where to go and what to see and do. Seems unnecessarily convoluted. I also find it disturbing that ‘they’ changed the termnology from ” Sound Event ” to ” Transportation Event “. The planners caught a LOT of grief over the inception of ” Sound Events” which did not appear in previous planning efforts. Obviously they did not want to yield to that grief so they just changed its name to something else without anyone hearing about it ( snide pun intended) . A rose by any other name, etc etc etc. The whole winter use planning process has been a Shakespearian farce. Thank you, Ruffin, for your post on the winter planning process. They could hardly make it more complicated! I’ve just linked to you on my blog: http://www.yellowstonetreasures.com/b2evolution/author.php, and will continue to do so as you keep those of us doomed to live far from the park informed about events and plans in and around our great park. I don’t know why you give credit to the gyc as some kind of expert organization. Afterall, they and the ninth circus court of appeals in san francisco think grizzly bears are endangered. Does anyone realize that if the radical environmental groups can sue and convince a judge that the “endangered” grizzly bear is affected by helicopters hazing bison back into the park (and stop it) they could easily dictate the use of snowmobile or car use in Yellowstone for the benefit of some endangered critter? Please please please tell me how the helicopter hazing is even a drop in the bucket (effecting bears) to the cars the go through Yellowstone all summer. The Endangered Species Act is an open ended money pit that these radical environmental groups can sit at the edge & selectively bob for apples to suit their wishes and needs! I love the “sound” or “transportation” events. How many loud Harleys go through the park in the summer? How many smokey RV’s and trucks pulling trailers go through the park in the summer? This confusing mess of what used to be fond memories of winters in the park has become an absolute farse!! Only an agency of the federable gummitt (POGO)could produce a plan as confusing as this. They continue to offend and outrage us all by looking at us as outlaws and requiring us to have a guide. Where else is there a similar reg?